During the process of conducting safety checks throughout the school it was identified that the yellow jungle gym playground equipment that was built by Mr. Stairs in the early 1980’s did not meet CPSC (Consumer Product Safety Commission) or ASTM (American Society Testing of Materials) codes and regulations for playground equipment for a public-school setting. The specific codes and regulations were not in effect when the equipment was built. It was recommended by the district’s insurance carrier and legal firm that the equipment be removed to eliminate any possible litigation against the district. Two questions were addressed: 1) could the current jungle gym be grand-fathered since it was built prior to the existing codes and 2) would it necessarily need to be replaced or just removed. Unfortunately, the equipment could not be granted any waiver or grandfathered, thus, keeping the risk of litigation to the district open. The easy answer to the second question is no, the equipment would not need to be replaced, just removed. However, that particular piece of equipment is without question one of the most popular pieces used during recess and other times when kids are out playing, such as during home football games. It was my recommendation to the Board of Education to replace the current piece of equipment with a variety of stand-alone climbing pieces. It was also recommended to update and replace the current teeter-totters. Two bids for new equipment were secured; one from Creative Sites and one from Crouch Recreation. Both designs were presented to parents during a meeting. The Board of Education accepted the bid from Creative Sites during its February Board meeting. 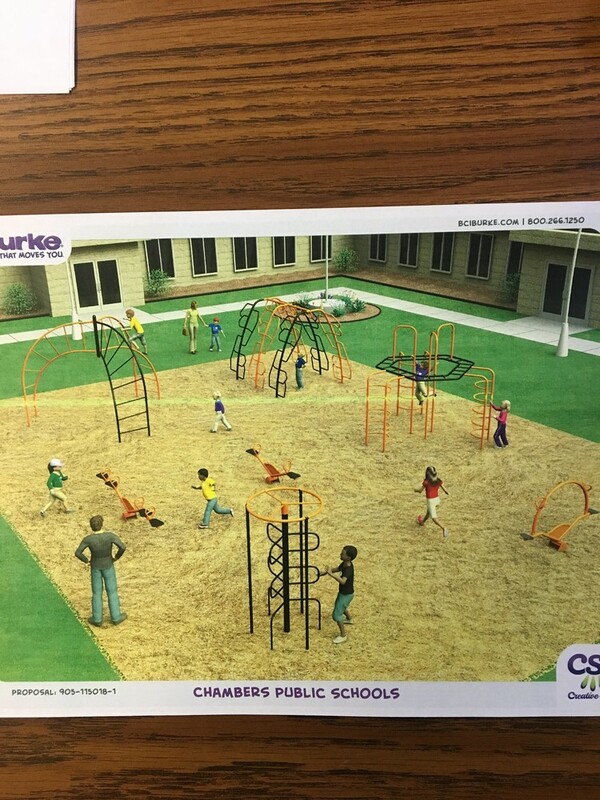 The installation of the new playground equipment will take place in July with completion before school starts. I am working with Mrs. Stairs to find an appropriate way to preserve the legacy of the jungle gym that Mr. Stairs built. A countless number of Chambers kids have played on it during their formative years and we want to honor Mr. Stairs for his time and effort in creating something that has had such a lasting impression on the school community.